Can't complain about a long, level, pull through on grass for the Passport America rate of $18 in February. We didn't pay extra for Wi-fi. Large dog park and lots of places to walk the dog. Very friendly folks. Clean bathrooms. We camped at Red Oaks RV Resort in a Fifth Wheel. We were surprised that an RV park this size could be so nice. At check-in staff were pleasant, and we were escorted to our site. The site was a pull-through and very spacious with 20/30/50 electric, water, sewer, and cable TV. Everyone in the park was very friendly. The park has a mixture of permanent, long term, and transient campers. Carefree Resorts has done a nice job with this park. 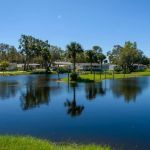 We camped at Red Oaks RV Resort in a Fifth Wheel. Nightly rate reflect the Passport America discount. This park is huge with a majority of it dedicated to permanent residents. The park has many big trees which make for nice shady dog walks. We had a nice long pull thru site situated with other travelers. All people we encountered were friendly and kind. The bathrooms and laundry were clean. I was able to take the dogs for an hour long walk and never leave the park or retrace my steps. There are loads of daily activities to keep you social and busy. It is easy to access the park from the freeway. A downside is that the Wi-Fi is only available for a fee from a vendor. We would stay here again. 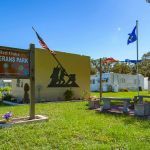 We camped at Red Oaks RV Resort in a Fifth Wheel. It is now called Red Oak. 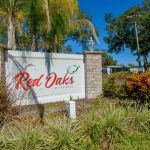 Red Oak is the combination of two parks, the Red Barn and The Oaks. It is a large park that caters to day campers and snow birds. The staff was friendly. The roads are blacktop and the pads were grass. There were many activities offered during the day and evening. Cable television was included in the rates. Wireless was offered at an additional fee. We would have rated the park higher, but our site was next to the interstate. It is a Passport America park. We will stay here again. We camped at Red Oaks RV Resort in a Fifth Wheel.